Born in Vienna in 1926, Peter Kinley arrived as a refugee in Britain in 1938 and served in the British army between 1944-48. Leaving the military to pursue painting, Kinley studied at Staatliche Kunstakademie, Düsseldorf (1948-49) before returning to England to continue his studies at St Martin’s School of Art, London (1949-53). At St Martin’s he studied alongside Frank Auerbach, Leon Kossoff, Robyn Denny and Joe Tilson. Later, he was to become good friends with Howard Hodgkin. His cosmopolitan upbringing and rigorous artistic training is clearly reflected in the strong European flavour of Kinley’s early work, where Matisse, Gauguin and de Staël were key influential figures. Kinley had a genuine and keen interest in the art of his time. His astute awareness of the period in which he was working creates a dialogue between Kinley’s works and those of fellow British artists Roger Hilton, William Scott and Terry Frost. 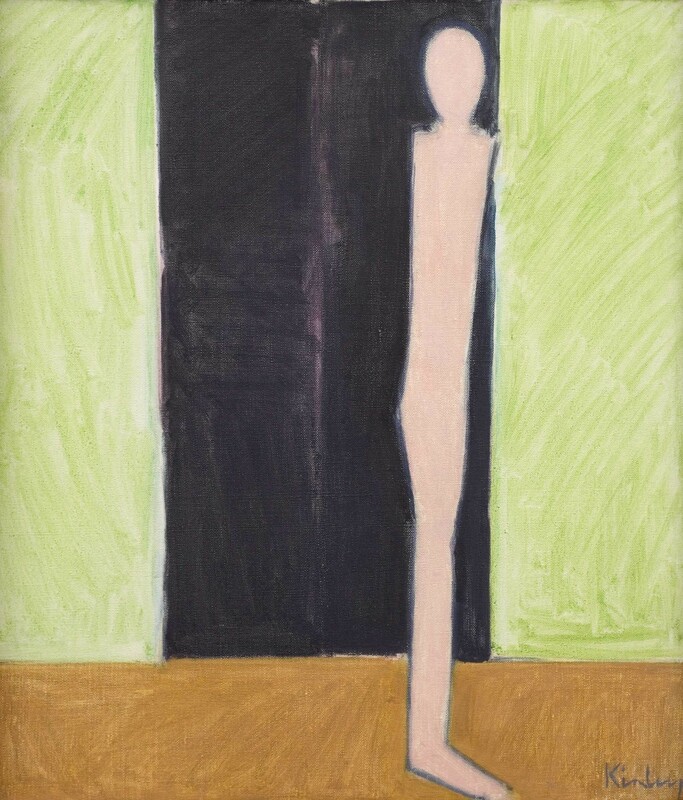 This 1967 painting, The Black Door, is a testament to Kinley’s calm and subtle artistic style. Its powerful and elegant simplicity demonstrates Kinley’s ability to work between abstraction and figuration. The broad washes of colour provide just enough indication of a figure without characterising it, while the perspective is distorted giving equal importance to both body and background. The minimalism of this painting defines his work of the late 1950s and 60s, which was dominated by single totem-like figures in stark and anonymous interiors. Peter Kinley’s art has long been held in the highest regard by his fellow artists and curators. His first solo exhibition was at Gimpel Fils Gallery, London in 1954, which lead to a series of successful shows at the gallery throughout the 1950s. Kinley went on to be exhibited widely throughout Britain, New York and India. Shortly before his death in 1988 Kinley had a retrospective at the Museum of Modern Art in Oxford and a solo show at Kettle’s Yard Gallery, Cambridge, (1986) which toured.